These are just a few of the innovation that you’ll discover on the Dolphin Quantum pool cleaner. We cover it in detail in the rest of the article. And if you’re wondering, it’s designed for inground pools. Jumping into a fresh swimming pool is extremely enjoyable when it’s warm outside. That enjoyment will turn to disgust pretty quickly if the water looks like a slimy pond. It’s why keeping your pool clean at all times while you’re using it throughout the year is so important, but have you got the right tool for the job at the moment? There are three major types of swimming pool cleaners on the market, but only the robotic ones should be taken into consideration if you’re serious about your pool. Models like the Dolphin Quantum pool cleaner are so advanced it’s hard to believe they’re real. Before we look at the benefits of robotic cleaners, let’s touch on how each type functions. Simple design, silent operation and low-cost maintenance. These have been around longer than any other type of pool cleaner, so there are still lots of them in circulation. They get their name because the hose attaches to the suction side of your pool where the water is sucked into the filtration system when the pump is switched on. That is one of the biggest drawbacks. A suction side pool cleaner will only work when your pump is switched on and will take advantage of the filtration system, which means it shortens their longevity. One of the other annoying things is how much they cost to run even though they’re cheap to buy. Front-wheel drive and treaded tires for maximum traction on inclined surfaces. The suction side cleaners were attached to the side of your pool sucking the water in, whereas pressure side pool cleaners are attached to the opposite side. It’s the side where the water is eventually pushed back into the pool, so when the cleaner is attached the pressure is used to move it around. At least a pressure side cleaner has its own filter bag attached, so the debris from your pool doesn’t have to use the filtration system. Unfortunately, it will still have to use the pool pump to help power it. In most cases they’ll also need to use an additional booster pump making them more undesirable. I’m sure you’ll have a few preconceptions about them due to the name, but before moving onto their benefits let’s take a basic look at how they work. They’ll plug into an outlet in your home before they go into the pool, but they’ll pass through a transformer to reduce the voltage. A motor will move your robotic pool cleaner through the water and it will have its own filter. In fact, your pool filtration system doesn’t even need to be running when the robot is operating. Models like the Dolphin Quantum pool cleaner have much more advanced features, but we’ll cover them all later on. With countless design innovation, this model will thoroughly clean your pool. NOTE: We discuss the Dolphin Quantum Pool Cleaner in-depth later in this article. If we were to look at all the benefits of robotic pool cleaners it would take too long. There are a ton of smaller benefits, but there are obviously a few big ones too. We’re going to focus on those at the moment to give you a feel for why models like the Dolphin Quantum pool cleaner are well worth the money. Don’t let the initial cost of robotic pool cleaners scare you away. You’ll save a lot more money in the long run, especially because new models like the Dolphin Quantum pool cleaner will last you years and years. As I’m sure you already know, when your pool is up and running it will send your electric bills through the roof. Robotic pool cleaners work independently of the swimming pool pump, so they’ll draw their energy from the mains. They’re over 90 percent more energy efficient and the voltage will be dropped very low for safety reasons. If a great model ends up using around 180 watts per hour to operate it will only cost you around 5 cents. Has a 90 minute cleaning cycle. No extra hoses, hookups or pumps required. The chlorine you put inside your swimming pool right now is probably terribly strong. It’s the reason why people have complained about opening their eyes underwater for decades. Nasty chemicals aren’t great for the environment, plus they’re not exactly wonderful for your health either. Robotic cleaners allow you to use less chemicals. They have the ability to catch all of the pollutants you would want chlorine to help with. One of the many reasons this works is because your pool doesn’t have to be running when the robotic pool cleaner is in action. It allows all of the pollutants swirling around in the water to fall onto the floor where they’ll be sucked up a lot easier. This is important to people for a number of different reasons, but even if they didn’t care there is no denying we have a water problem. You might feel guilty enough owning a swimming pool in the first place, so saving what water you can is the least you can do. Robotic pool cleaners will help you do it thanks to the way they filter the water. Let’s imagine you didn’t clean the water with a Dolphin Quantum pool cleaner. Instead, all of the dirt, algae, bacteria, and everything else made its way to your pool filter. It would get very dirty in a hurry and you’d need to backwash the system on a regular basis. This would mean flushing a huge amount of water into the ground. Suction side and pressure side pool cleaners will never be able to freshen up your water like a robotic model. You wouldn’t even be able to clean your pool as well if you jumped in with a brush and did most of it yourself. The main reason why they’re so effective is because of the places they can reach, which is everywhere if you don’t have very steep sides. They’ll be able to clean up everything from the floor of your pool and they will get the leaves on the surface. Robotic pool cleaners will climb up the sides of your walls to scrub them spotless because they’re so technologically advanced. Not only will they reach all areas of your pool, but they have a micron rating good enough to collect tiny particles. Technology is designed to make our lives easier, so if there is a machine with the ability to save you tens of hours each month you’re going to love it. Robotic pool cleaners don’t take a very long time to set up. Once you’ve thrown one into the pool, you can go away and forget about it while the pool is cleaned from top to bottom. Some even have the ability to scan your pool and decide on the most efficient route to take. Once you’ve plugged it in and pressed a button half your job is done. Once the robotic cleaner is finished scrubbing down your pool the only thing you have to do is clean it out to make sure there is enough room when it’s time to go again. Maytronics have led the way in pool cleaning products for nearly 25 years. With each new model they release the technology is better than anything you could imagine. You already know the main benefits of robotic cleaners and why they should be your number one choice, but let’s look closely at what makes the Dolphin Quantum pool cleaner stand out in a crowded market. When they designed the next Dolphin they wanted it to defy the laws of physics. That might be impossible in a literal sense, but they’ve managed to break the rules inside a swimming pool. Any machine can be propelled forwards, but the Dolphin Quantum pool cleaner will be able to move laterally as it cleans the walls of your swimming pool. They’ve accomplished this by adding in patent-pending PowerJet 3D Mobility. You’ll see powerful vortex jets on the top and sides of the cleaner that will give it the ability to move almost anywhere. They have also spent a huge amount of time researching ideal weight distribution to improve the mobility of the swimming pool cleaner even more. Includes a new 400 square inch cartridge – highest capacity ever for a pool robot. It’s been claimed the cartridge filtration system inside the Dolphin Quantum pool cleaner is the biggest of its kind. With a 400 square inch cartridge you can be sure you’ll never have to worry about being able to get into the smallest of cavities where debris likes to hide. It can also be snapped apart and pulled out within seconds when the LED light says it needs emptied. You’ll have access to four different filters with a different micron range for each one. The smallest of the bunch is called the NanoFilter, and it has the ability to pick up particles down to 2 microns in size. That is twelve times smaller than what you’re able to see with the human eye, so you can be sure the machine will catch everything. All robotic pool cleaners will collect leaves and pick up loose dirt on the bottom of your pool. The problem comes when the grime is stuck so much there simply isn’t enough power to get it off. To overcome this obstacle the Dolphin Quantum pool cleaner has a HyperBrush dual scrubbing system, so the brushes will spin at twice the speed of ordinary ones. Dual high RPM brush power scrubs every square inch of any pool. You might have noticed the machine doesn’t have any wheels, but instead it runs on rubber HyperGrip tracks. Not only does it make the robotic cleaner extremely grippy, but it’s going to have just as much traction even on vertical walls. This will ensure every inch of your pool is as clean as possible as the brushes will get to it. Every robotic cleaner will have a built-in navigation system, but you won’t have seen anything like the SmartNav 2.0. Once dropped into your pool it will automatically scan the area it’s got to work with before doing anything. It will then decide on the perfect route after taking speed and energy efficiency into consideration. The Dolphin Quantum pool cleaner will know exactly where it’s already been, so it will never go over the same area twice. It also has the power to pinpoint where your drains and ladders are sitting. This allows it to clean carefully without getting stuck like a lot of other robotic pool cleaners, so you won’t waste time freeing it. First of all, the Dolphin Quantum pool cleaner only weighs a fraction over 27 pounds. Nobody is going to have any trouble carrying it even when it’s full of debris. The Exoskel minimalist design doesn’t take away from the strength of the machine, so it’s not going to slip out of your hands and fall apart. It’s definitely built to last even though it’s so light. It might have had all non-essential parts stripped out, but the handle on the front of the machine has been included for obvious reasons. It’s positioned to make it easy to lift the Quantum straight out of the pool. It’s helped along by the fast water release system, which will flush excess water away as soon as it’s out of the pool. We have already talked about robotic pool cleaners making your life a lot easier, but perhaps the Quantum makes it too easy. It’s programmable and you’ll be in complete control the entire time, so you won’t even need to keep plugging the machine in. If you leave it inside the pool it will clean up automatically when you decide it should. It could be daily, bi-weekly, or any other frequency depending on how dirty your pool usually gets. Even though it’s only got a dual 24V DC motor, it can still make its way around a 60 feet long pool in a couple of hours. You might not want to leave your robotic cleaner in the pool 24/7 to help extend its life, but it’s a nice option to have when you’re out of town. Learn more on the official Dolphin Quantum site. Cleans & scrubs every square inch of the pool, including coves, walls, & the waterline. The Dolphin Premier is built by the same company as the Dolphin Quantum pool cleaner, but they look completely different. It’s obvious they weren’t going to come out with two identical models, but there is something special about the way Dolphin designed the Premier. It’s been built from the ground up on a modular DIY platform. This essentially means you’ll be able to carry out any necessary repairs on your own. You won’t actually have to fix anything using tools, but instead you’ll just open the machine up and replace the individual part causing you problems. Even if you don’t want to repair it yourself it will only take a local dealer around 10 minutes to fix. This is probably one area where customers have had problems with their Dolphin Quantum pool cleaner. Although it’s got a 60 ft cable and it’s been designed to move in the right way, there is a chance the cable will tangle up every now and again. If it happens to you a few times it can begin to get a little annoying. The Dolphin Premier pool cleaner takes that problem straight out of the equation. This is because the cable sitting on top of your machine will be attached to a 360 degree cable swivel. It will never get tangled no matter what happens. It’s also worth pointing out the cable swivel itself won’t wear down and stop working after so many turns. The reason we’ve not mentioned this until now is because the Dolphin Quantum pool cleaner only comes with a 2 year warranty, but when you buy the Dolphin Premier you’ll get an extra year added on. The company believe everyone investing their money in a Dolphin product deserve peace of mind after making a big purchase. With other models your warranty could be affected by things like how many hours you’ve used it or the number of cycles it’s been through. The Premier is built to last a very long time, so if you have any problems in the first 3 years they’ll deal with it for you free of charge. There are lots of places around the country where you can take it. There are a few different Premier options available to you, but they’re by no means essential. On the other hand, they can make your life a lot easier. The first one is a Dolphin Premier Caddy to help you transport it around, because this model weighs just over 36 pounds. The caddy also comes in handy when you’re storing the machine away. The second extra you can purchase is a remote control. Although the robotic pool cleaner is designed to clean everything on its own, you’ll be able to send it to a certain location if something needs cleaned up immediately. Lastly, you’ve got an oversized debris bag in case your swimming pool gets very messy. Please Note: The Quantum and Premier models are very similar, so the latter still contains all of the amazing features we’ve already talked about before. Learn more about the Dolphin Premier pool cleaner by visiting the official site. Includes : 7-day programmable timer, handheld remote & powder coated alloy caddy. Has 4WD Technology For Getting Around – One of the biggest questions you have to ask yourself before buying a robotic vacuum cleaner is whether or not it’s going to reach everywhere in your pool. The 4-wheel drive technology and rear water propulsion system will let it go up walls, climb up stairs, and squeeze into tight corners. Features A Dirty Canister Indicator – All of your debris will make its way into a canister, which happens to be easy to clean. You slip it out of the machine and it can be emptied with a rapid shake and spray. The dirty canister indicator will even tell you when it’s time to clean it out, which will save you lots of unnecessary effort. Includes a full size caddy, which you’ll love and appreciate. Easy to move around. It Has An Easy Lift System Built In – You already know the Dolphin Quantum pool cleaner is easy to lift out of the water, but the Polaris 9550 Sport takes things to the next level. If you press a button the machine will raise up to the surface at your desired location. It also has the ability to remove excess water immediately to lighten the load. You’ll Get A Helpful Remote Control – The Dolphin Quantum didn’t come with a remote control. We spoke about the Dolphin Premier having one, but it only comes as an optional extra. The 9550 Sport comes with a remote as standard, so you can point and shoot when you want to clean a section of the pool. It actually comes with a caddy as standard too. 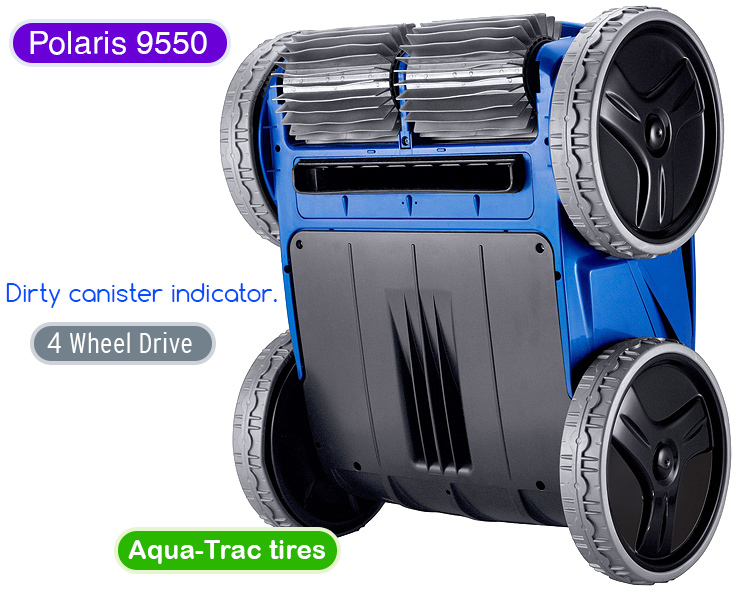 It’s Programmable For Up To A Week – You’ll have the power to set this robotic pool cleaner for up to a week in advance. You just need to choose the days and times you want it to get to work and it will do everything on its own. Again, this isn’t always the best idea if you want to prolong its life, so it’s maybe best left for when you’re away. It Can Focus Purely On The Waterline – When the Polaris 9550 Sport pool cleaner gets to work it’s going to take a few hours until it’s done. What if you don’t need to give the entire pool a good scrub? This model gives you the option of only cleaning the waterline so you’ll not have to scoop things like fallen leaves out with a net. Please Note: It also has standard robotic cleaner features, so it can make its way around the pool on its own and exert more vacuum pressure than other cleaners. Sadly, apart from its unique features the Dolphin models have the edge in other departments. Robotic pool cleaners have been in a league of their own for a long time, but the gap is becoming so much wider as technology improves. The features on the Dolphin Quantum pool cleaner are head and shoulders above anything you would have found a few years ago. Going down the robotic route is the only sensible choice now. You’ve just got to decide which one you like best. There isn’t any wrong choice because customers love all of the models we’ve spoken about today. The best course of action would be to pick the one you like the most. Now read as many unbiased Amazon reviews as possible before coming to your final decision.